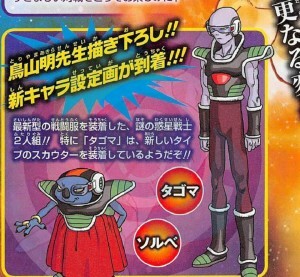 A clear picture of the two villains responsible for ressurecting Frieza in the upcoming Dragon Ball 2015 movie have been released through V-Jump magazine. The two remaining soldiers from Freizas once great army Sorbet and Tagoma visit Earth to find the Dragon Balls and make a wish for a stronger Frieza to return. Akira Toriyama said after they made Battle of Gods he wanted to make a movie that would focus on Vegeta. If that’s still true this movie might see Vegeta go Super Sayan 3 and God mode in this movie.